Starter for 10 is a 2006 British comedy-drama film directed by Tom Vaughan from a screenplay by David Nicholls, adapted from his own novel Starter for Ten. 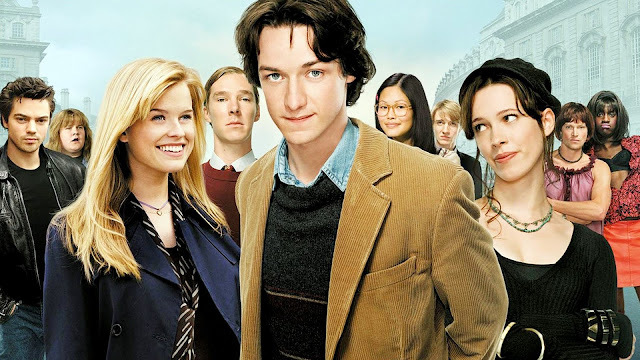 The film stars James McAvoy as a university student who wins a place on a University Challenge quiz team. It premiered at the Toronto Film Festival in September 2006, and was released in the UK and Ireland on 10 November 2006, and in Canada and the US on 23 February 2007. "In 1985, Brian Jackson is a first-year university student and information sponge. Since his working-class childhood in Southend-on-Sea, Brian has loved the TV quiz show University Challenge, whose famous catchphrase—""Your starter for 10""—gives the film its title. Soon after arriving at Bristol University, Brian attends a party where he meets the politically conscious Rebecca, with whom he seems to have an instant connection. Brian attempts to join their University Challenge team but narrowly fails to secure a spot when he helps another potential candidate, Alice, cheat on the qualifying test. Brian falls for the glamorous Alice and tries to date her, despite her multiple signals that she only sees him as a platonic friend. As the term starts, Brian is invited to join the University Challenge team after one of the other members falls ill. The captain of the team, Patrick Watts, is a stuck-up post-grad who has managed to remain team captain despite never having achieved success on University Challenge. Brian immediately impresses the rest of the team with his wealth of trivia knowledge and uses his time with the team to get closer to Alice, eventually getting invited to her house for the Christmas holiday. Unfortunately, Brian embarrasses himself in front of her family by getting stoned while trying to impress Alice. He returns to Bristol to spend the rest of the vacation and meets Rebecca again. They once more hit it off, but as they are hooking up, he inadvertently calls her ""Alice"", offending her and ruining the moment. Following his romantic failures, he talks with Spencer, his friend from Southend, who tells him that he is in legal trouble on account of his criminal activities. Brian invites him to a party before he has to face the judge. During the party, Patrick insults Spencer's upbringing and belittles him in front of the rest of the partygoers. In retaliation, Spencer hits Patrick in the face and disrupts the event. In the aftermath, Brian shares a drink with Rebecca and tries to apologise for his behaviour. However, Rebecca still feels that Brian is in love with Alice and encourages him to follow his heart and tell her how he feels. He takes her advice and arrives at Alice's flat to declare his love, but discovers Spencer already there. Excited by his violent behaviour at the party, she had invited him back to her place. Brian feels betrayed by both Alice and Spencer, especially since he had told his friend how he had felt about her. Brian falls into a depression and struggles with not only concentrating during University Challenge practices, but also with his studies, threatening his university place. Patrick becomes increasingly frustrated with Brian, and just as they arrive for their University Challenge match, berates him for his lack of focus. Brian headbutts Patrick in response, but only ends up knocking himself unconscious. He is revived backstage by Rebecca who has come to watch the show and gives him encouragement before he is escorted to the set. However, as he is being brought back to his team, Brian is briefly left with an open envelope containing the quiz questions. He reads one of the cards before putting it back in the envelope, and, inspired by the relative ease of the question, rejoins his team. The match starts off poorly, with nerves clearly getting to Patrick as he fails to answer several questions and puts the team in a hole. Brian slowly but surely digs them out of it, getting into his swing as he answers question after question. As the match is heating up and Brian's team has the momentum, Brian inadvertently gives the answer to the card that he had previously seen even before Bamber Gascoigne, the quizmaster, has had time to read the question. Realising that Brian has seen the cards, Gascoigne suspends the match and Brian's team is disqualified. Brian returns home and falls back into another depression, sleeping all day and ignoring incoming calls. His mother tries to get him out of the house, but the only person who is finally able to reach him is Spencer. He tells Brian that Gascoigne had gone easy on him, and that he is sorry for his behaviour and proud of Brian for chasing his dreams at University. Inspired by his friend, Brian returns to his studies and meets with his tutor, promising him that he is back for good. He then stands Alice up to visit Rebecca at a demonstration against nuclear weapons. He asks her if it she could ever forgive him for all the mistakes he has made, and if they can start again. She replies that he already knows the answer, and they kiss as the film ends."